When I need to create charts, my first choice is Google Charts or another dedicated library. Sometimes, though, I need some specific features that I can’t find there. 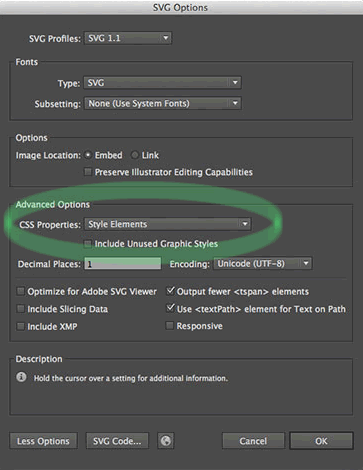 In these cases, SVG images prove to be very valuable. 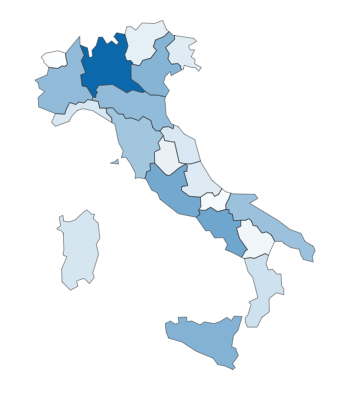 Recently, I had to build a report page that was able to show a map of Italy in which each region had a different color tone according to some values retrieved from a database. Thanks to SVG, this task was very easy. 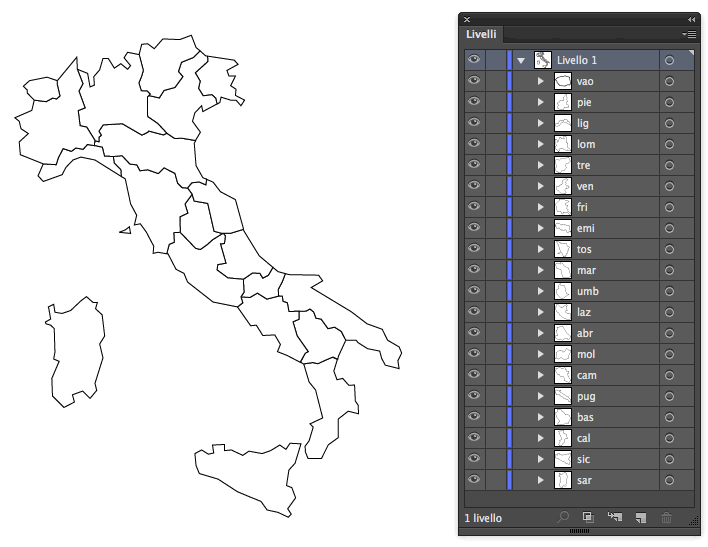 Every region is drawn as a single object, and each of them has its own level, with a name matching the code used in the database to identify its relative data (for example: “tos” for Tuscany). Opening the file just created, you will see it contains a set of g tags whose IDs match the names of Illustrator levels. 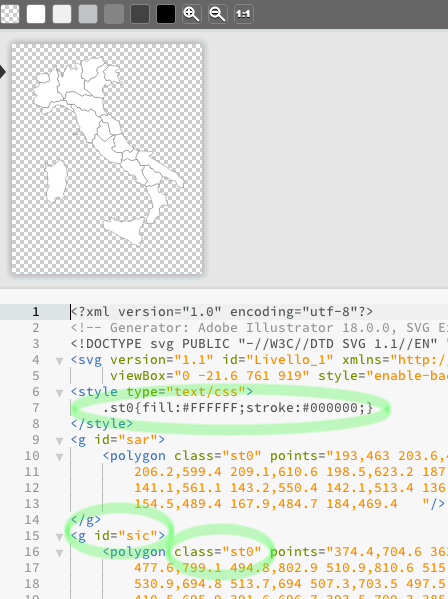 You can see that the style attribute inside the svg tag has been erased and replaced by a new one located inside the document head; all g elements have been initially filled with a light grey. 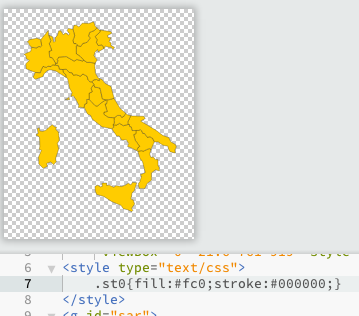 The st0 class is no longer used (you can remove it from your SVG code) and it has been replaced by the .map g selector. Anyway, this is not mandatory, you can use the CSS selectors you prefer. The second step consists of binding our map to some data retrieved from our database. In this example, our goal is to paint the map according to the population of each region. Data is retrieved in JSON format and pasted directly inside our HTML file (in the real world, of course, data would be retrieved using Ajax or similar). After that, a color is chosen (in this case, #0b68aa), and we assign it to the region with the highest population value. The other regions will be colored with tones of the main color in proportion to their percentage of the population. First of all, we have to determine the region with the maximum population value. This can be done with a few rows of code. The map can be improved adding by some interactivity. We want it to show the population value when the mouse is positioned over regions. The !important modifier in .map g:hover is needed to improve the specificity of the fill rule, otherwise it would be bypassed by injected inline CSS. The last method, mousemove, retrieves mouse coordinates and assigns them to the generated divs. See the Pen KDHfh by SitePoint (@SitePoint) on CodePen.